With newspapers, blogs, and websites wrapping up their Top Ten album lists for 2013, we thought we'd take a look at some favorite music a bit further in the past as well. Today, we’re releasing a visualization to show which music has stood the test of time, and how genres and artists have risen and fallen in popularity. 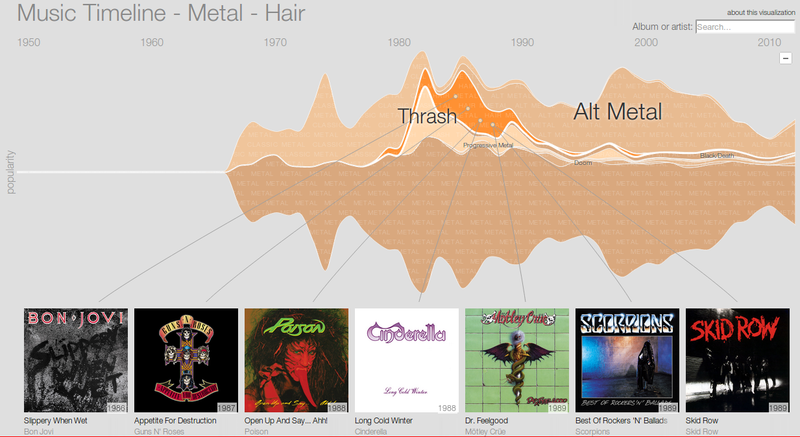 The Music Timeline uses aggregated data from Google Play Music to show the changes in music genres over the decades. 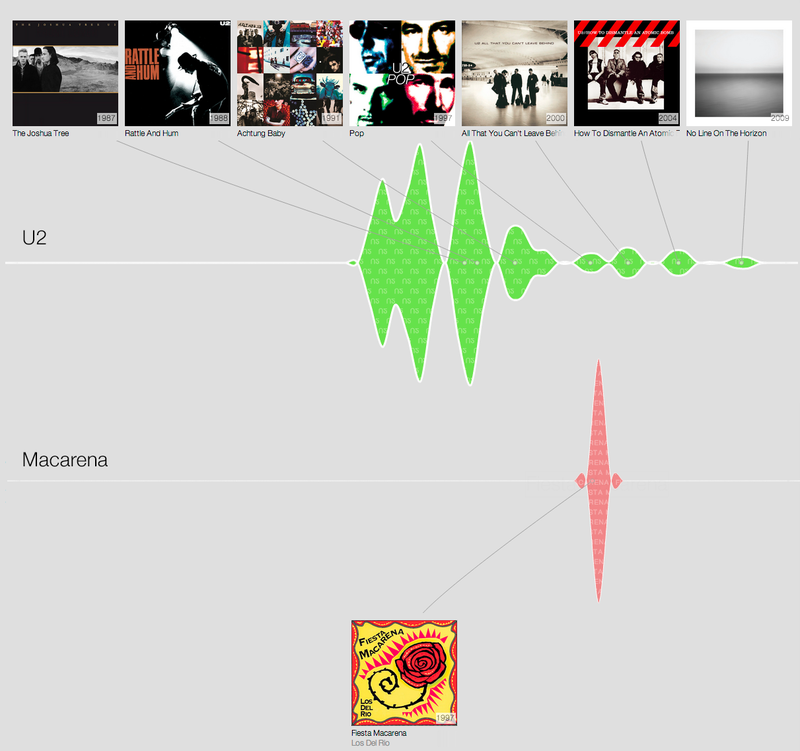 This visualization shows which albums from past eras are still in our music libraries today. Dig deeper into the chart to highlight key artists in each genre and read their stories, and navigate to Google Play to hear their music. For example, by clicking on the Metal stripe, we can see the handoff from Classic Metal to Hair Metal to Alt Metal within the growth of the overall genre, as well as some of the most popular artists that composed each subgenre. The overall shape of each major genre shows when it hit the scene and when it retreated -- for example, R&B has a long history of resurgences, but Electronica is a strictly recent phenomenon. Delve into changes in the vocabulary used to name artists and their work -- funk may be over as a genre, but as a band or album name it seems to be timeless. Or search for a particular artist to see the trajectory of their career -- contrast U2’s long-running reinvention and re-emergence from the ‘80s up to today, versus a one hit wonder like Los del Río’s 1995 Macarena. For more explorations of how information visualization can make complex data accessible, useful, and even fun, check out the Big Picture project page at research.google.com/bigpicture. We expect this is the first of many collaborations with the Music Recommendations and Discovery team. In July, Google launched a new pilot program, CS First, located in our South Carolina data center, to ignite interest in computer science (CS) for K-12 students, especially underrepresented minorities and girls. Collaborate - coding is social! With these goals in mind, we began pilot programs in Berkeley, Charleston, and Dorchester counties, exposing students, with a focus on underrepresented minorities and girls, to the most promising existing content and tools. We then observed the clubs, collected survey data and iterated to improve the content and tools that worked best. To date, CS First has run 31 after-school programs for 4th-12th grades, reaching more than 450 students. Of those students, 53% were girls, and 66% qualify for free or reduced lunch. Each after-school program lasted four weeks and consisted of eight 60-90 minute lessons using a variety of tools such as App Inventor, Scratch, Blockly, Python in Codacademy, Scheme in Bootstrap, as well as various physical gadgets like Finch Robots, Little Bits, Sphero and Raspberry Pi. Students were most engaged when they had a creative outlet or where there was a big "wow-factor". They were less engaged with tools that were strongly scaffolded for learning and did not result in a creative result. In this initial set of pilots, students were most engaged with Scratch and App Inventor. Club culture is as important as the tool choice for engagement levels and therefore we continue to intentionally create a social club environment. Scaffolding and forward momentum are especially important in creative design-oriented tools. Students sometimes became distracted by the design aspects of Scratch and would often not code unless club structure included accountability. "I can create things with computer science": Students agreed with this statement 25% more after the program. "If I get stuck on a computer problem, I know how I might fix it": An increase of 22% after the program. "Do you like programming? ": The number of “yes” responses increased 29%. "Do you think computer science is cool?" The number of “yes” responses increased 26%. "I don't really understand computer science": Students agreed with this statement 34% less after the program. In November, we began working with 4 non-teacher technologists to understand the challenges of scaling through volunteers. In our January programs, we will pilot with 10 community members leading the clubs in partnership with local school districts. The outcome will be a polished kit of tested materials which teachers and volunteers can use to lead an after-school CS First club with students. The kit is designed so that a teacher with little CS experience or a technologist with little teaching experience will be able to implement it with a group of 10-20 students. The ultimate goal of CS First is to provide proven teaching materials, screencasts, and curricula for after-school programs that will ignite the interest and confidence of underrepresented minorities and girls in CS and to scale these programs through a network of teacher sponsors, volunteers and national organizations.